I wasn’t sure I would get the Spool top assembled this week as planned but it’s done. I mentioned yesterday that I’m not a perfectionist so I’m not going to fix the error I found just now! 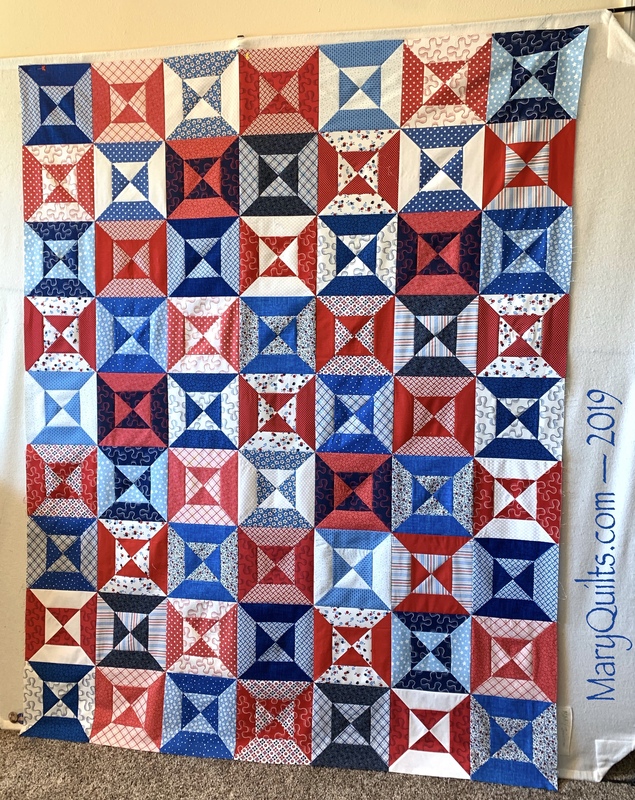 I have brief instructions on the website for a smaller version of this quilt and it counts as my Precut Party quilt for March – made from 2.5 inch strips. I don’t see an error at all. The top looks lovely. It’s all good. No one will even notice. I think it looks AWESOME!! I love this!!! So pretty! No one will know unless you tell them there are errors. If I found it I see 5 blocks but I really had to work at it and go block by block—-So I could be wrong and I am not telling where I think they are. You did a great job looks wonderful. Oh, I always rise to that bait and it’s like playing the “Spot the Differences” game. Not in a mean way, believe me. It’s simply fun for me! It also reminds me of a woman at a guild meeting who showed us her quilt and said, “I made one mistake. Can anyone spot it?” I think it took ten minutes before we were done pointing out ALL the mistakes we spotted. Hubris, anyone? It’s beautiful!! I looked for a couple of minutes and never found an error so it is well hidden. Very nice pattern! If you had not mentionned the error I surely never noticed it look so beautiful. As a little game I checked carefully and i fund it : row 7, second square from the right. I couldn’t find it, so I think you’re good. It looks great! I love it!!! and I want to copy it soon! Error? What error? Where is it? Looks great to me! Third row up from bottom, second column from right. Right? But so what. Didn’t the old-time quilters used to include something like that, intentionally, calling it a “humility block”? (Would never have even seen it if you hadn’t told us.) Such a cheerful-looking quilt! It lifts my spirits just looking at it.